I was super stoked when Smiffys said they'd send me a halloween costume, and when it arrived I started practising my skull make up straight away, much to the dismay of my family... Soz guys. So, I got this 'Sugar Skull Cat' from them... 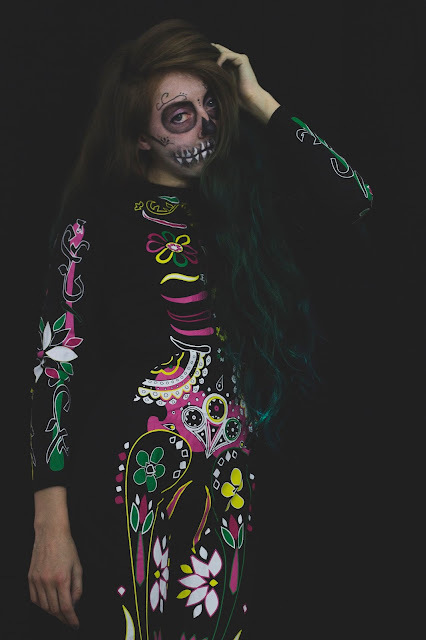 It's basically a black morph suit with really funky designs inspired by 'Day of the Dead' or 'Dia de los Muertos'. I love this because it's such a great costume, really easy to just throw on and the quality of the printing is incredible. They also have loads of other cool costumes to suit what you're looking for, including celebrities, fairy tale characters, and animals! I'm actually away on holiday for Halloween this year, and I'll be travelling on Halloween so me and my little sisters are going to have our own version of Halloween instead. Pretty gutted I won't be going out drinking, or going to parties etc, but trust me, I will still dress up!